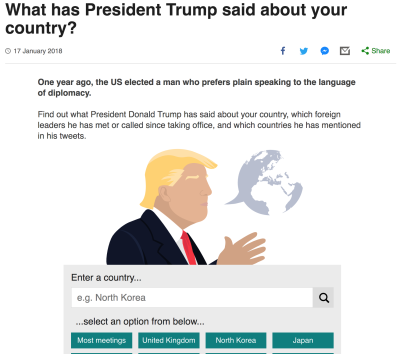 While this is understandable from a historical context — the web has always been about progressive enhancement — the question remains: Are we slowing down the web for the majority of our users in order to support a diminishing set of legacy browsers? On average, untranspiled bundles are about 25% smaller than those that have been transpiled down to ES5. This isn’t surprising given that ES6+ provides a more compact and expressive way to represent the equivalent logic and that transpilation of some of these features to ES5 can require a lot of code. While Babel does a good job of applying syntactical transforms to our ES6+ code, built-in features introduced in ES6+ — such as Promise, Map and Set, and new array and string methods — still need to be polyfilled. Dropping in babel-polyfill as is can add close to 90 KB to your minified bundle. Modern web application development has been simplified due to the availability of a plethora of new browser APIs. Commonly used ones are fetch, for requesting for resources, IntersectionObserver, for efficiently observing the visibility of elements, and the URL specification, which makes reading and manipulation of URLs on the web easier. 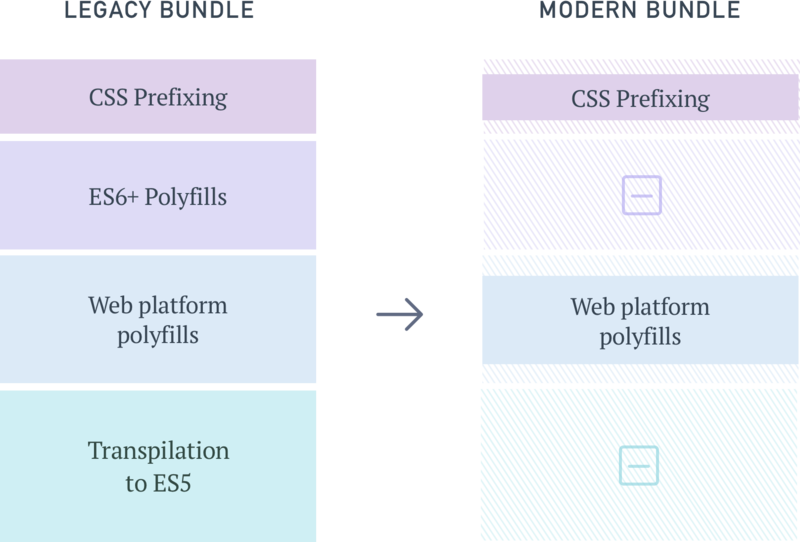 Adding a spec-compliant polyfill for each of these features can have a noticeable impact on bundle size. Lastly, let’s look at the impact of CSS prefixing. While prefixes aren’t going to add as much dead weight to bundles as other build transforms do — especially because they compress well when Gzip’d — there are still some savings to be achieved here. It’s probably evident where I’m going with this. If we leverage existing build pipelines to ship these compatibility layers only to browsers that require it, we can deliver a lighter experience to the rest of our users — those who form a rising majority — while maintaining compatibility for older browsers. The selection of polyfills is limited to those listed by the service — unless you host and maintain the service yourself. Because the polyfilling happens at runtime and is a blocking operation, page-loading time can be significantly higher for users on old browsers. Serving a custom-made polyfill file to every user introduces entropy to the system, which makes troubleshooting harder when things go wrong. Also, this doesn’t solve the problem of weight added by transpilation of the application code, which at times can be larger than the polyfills themselves. Let see how we can solve for all of the sources of bloat we’ve identified till now. This will be our build tool, although the process will remain similar to that of other build tools, like Parcel and Rollup. With this, we’ll manage and define the browsers we’d like to support. And we’ll use some Browserslist support plugins. First, we’ll want to make clear what we mean by “modern” and “legacy” browsers. For ease of maintenance and testing, it helps to divide browsers into two discrete groups: adding browsers that require little to no polyfilling or transpilation to our modern list, and putting the rest on our legacy list. The list given here is only an example and can be customized and updated based on your website’s requirements and the time available. This configuration will act as the source of truth for the two sets of front-end bundles that we will create next: one for the modern browsers and one for all other users. Enabling the useBuiltIns flag allows Babel to selectively polyfill built-in features that were introduced as part of ES6+. Because it filters polyfills to include only the ones required by the environment, we mitigate the cost of shipping with babel-polyfill in its entirety. For this flag to work, we will also need to import babel-polyfill in our entry point. Doing so will replace the large babel-polyfill import with granular imports, filtered by the browser environment that we’re targeting. This is the only step in our flow that requires some degree of manual maintenance. We can make this process less error-prone by adding eslint-plugin-compat to the project. This plugin warns us when we use a browser feature that hasn’t been polyfilled yet. Finally, let’s see how we can cut down on CSS prefixes for browsers that don’t require it. Because autoprefixer was one of the first tools in the ecosystem to support reading from a browserslist configuration file, we don’t have much to do here. Now that we’ve defined all of the required plugin configurations, we can put together a webpack configuration that reads these and outputs two separate builds in dist/modern and dist/legacy folders. "build:modern": "BROWSERSLIST_ENV=modern webpack -p --config webpack.config.js"
That’s it. Running yarn build should now give us two builds, which are equivalent in functionality. Creating separate builds helps us achieve only the first half of our goal. We still need to identify and serve the right bundle to users. Remember the Browserslist configuration we defined earlier? Wouldn’t it be nice if we could use the same configuration to determine which category the user falls into? Here, setting the allowHigherVersions flag ensures that if newer versions of a browser are released — ones that are not yet a part of Can I Use’s database — they will still report as truthy for modern browsers. One of browserslist-useragent’s functions is to ensure that platform quirks are taken into account while matching user agents. For example, all browsers on iOS (including Chrome) use WebKit as the underlying engine and will be matched to the respective Safari-specific Browserslist query. It might not be prudent to rely solely on the correctness of user-agent parsing in production. 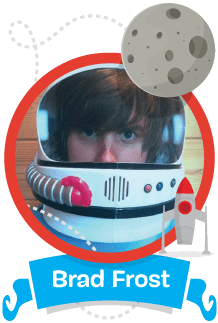 By falling back to the legacy bundle for browsers that aren’t defined in the modern list or that have unknown or unparseable user-agent strings, we ensure that our website still works. One is required to maintain only a single Browserslist configuration that powers all of the tools in this pipeline. 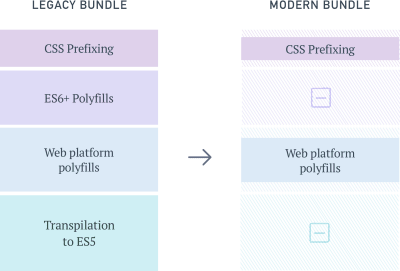 Updating the definitions of modern and legacy browsers can be done anytime in the future without having to refactor supporting configurations or code. I’d argue that this makes the maintenance overhead almost negligible. There is, however, a small theoretical risk associated with relying on Babel to produce two different code bundles, each of which needs to work fine in its respective environment. While errors due to differences in bundles might be rare, monitoring these variants for errors should help to identify and effectively mitigate any issues. Unlike other techniques prevalent today, all of these optimizations occur at build time and are invisible to the client. The experience of users on modern browsers becomes significantly faster, while users on legacy browsers continue to get served the same bundle as before, without any negative consequences. We often avoid using new browser features due to the size of polyfills required to use them. At times, we even choose smaller non-spec-compliant polyfills to save on size. This new approach allows us to use spec-compliant polyfills without worrying much about affecting all users. Given the significant advantages, we adopted this build pipeline when creating a new mobile checkout experience for customers of Urban Ladder, one of India’s largest furniture and decor retailers.